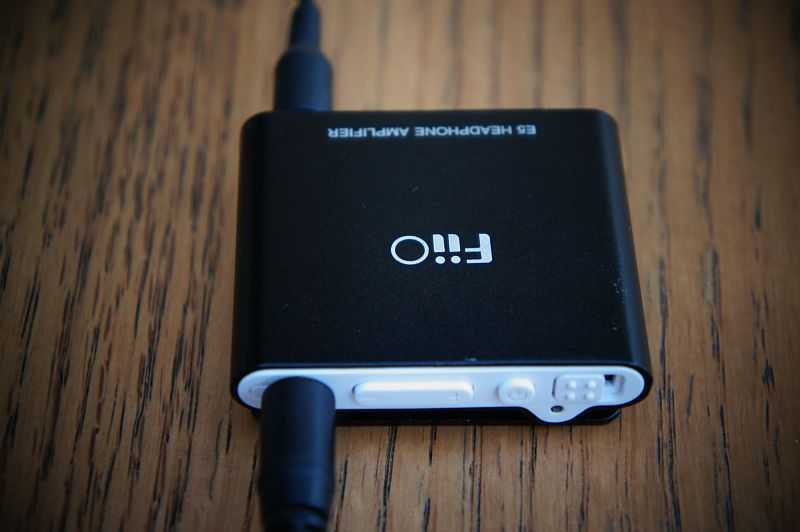 Our editor has had requests for a review of the little FiiO headphone amplifiers and contacted the staff to see if anyone could provide one. 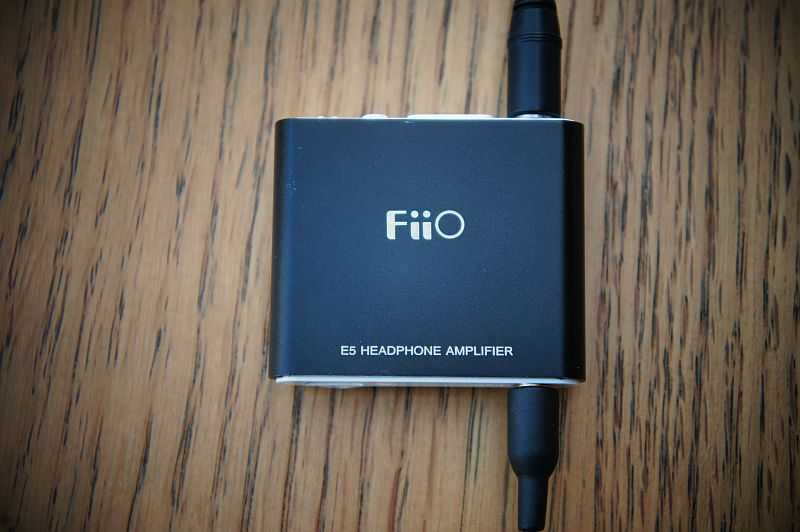 Given the price of some headphone amplifiers I guess some bargain hunters are wondering whether the FiiO may be a giant killer. I happened to have one to hand that I had bought to power a pair of particularly insensitive headphones so offered to have a good look and a critical listen. The E5 is very well made. It is designed very much in the style of the iPod shuffle, a small metal case with controls and connections on top and bottom. It’s a little over four cm wide, a little under four cm tall and about one cm thick half of which is the unit itself and half is the clip. It feels sturdy and has an excellent paint finish, both in cosmetic terms and resilience. The top panel houses the headphone output, a volume control bar, power button and a bass boost switch. The lower edge has the audio jack input and a mini-USB power input for recharging the internal battery. The E5 is designed to boost the headphone output from portable audio devices, although at a pinch, it could also be used with the line output from any audio source if a Y-adapter was used to feed the single mini-jack input. I tried it with a range of headphones and output devices. Most of my headphones are very efficient. With the efficient headphones the amplifier simply allowed the output device to be operated at a slightly lower output level for the same subjective volume in the headphones. To be honest I was surprised it didn’t make more difference than it did. I’d say that with the setup I tried first – a Sansa Clip MP3 player and Sennheiser PX100 headphones it made very roughly ten per cent difference to the level at which the Sansa’s output had to be set to get the same volume. So the volume boost is not massive but can be useful if playing into headphones with a more challenging load. I got similar results with the same headphones and a Creative Zen Stone. I then moved on to a pair of Sennheiser PCX250 noise cancelling headphones. Although superficially similar to the PX100, these headphones are far less sensitive (300 ohm impedance against the PX100’s 32 ohms). Without the boost provided by the FiiO I found it difficult always to get the listening level as high as I like it (which isn’t a crazy level). With the FiiO in circuit that was no longer an issue - the volume would go louder that I would want on virtually all material, although there still wasn’t much dynamic headroom on more quietly recorded tracks. Continuing my exploration of this miniature audio world, a third generation iPod touch didn’t need the same boost as the smaller players. Curiously the FiiO hardly affected the volume from the iPod at all into the PCX250’s but it did have a more pronounced effect on the tone. Switching back to PX100’s the volume boost became available again and the sound was enriched slightly. So, taking the new Bruce Springsteen album, Wrecking Ball as an example, the power of the floor toms and rock guitars on the opening track, "We Take Care of Our Own" comes over more forcefully with the E5 in circuit and the bass is warmer. Using the Sansa Clip and the Zen Stone, with the bass boost switched out the amplifier was transparent. With the bass boost circuit engaged the sound gained a little body and the relative output lower registers was brought up in the mix. The effect was (thankfully) not exaggerated and could be useful if your headphones are a little bass shy in their presentation – although obviously it won’t turn tinny earbuds into full on cans. With the iPod by contrast, the amp added a little richness to the tone even with the bass boost switched out but it seemed to have little impact on the volume. Having said that, the output of the iPod was more than enough to drive the insensitive headphones. I can only deduce that, similar to most equipment, the detail of the impedance relationships between items in the signal chain will have a major impact on the sound. I have an old Panasonic portable CD player which has a mini jack line output as well as the normal headphone out. In direct comparison, with sensitive headphones, it was difficult to hear any difference. This suggests, logically, that the quality of the FiiO’s amplification is similar to that of the Panasonic. In fairness, the Panasonic was a very good quality machine in its day, so this is no insult to the FiiO, but on the other hand potential purchasers should not expect to get a real giant killer. A good, honest, well made and welcome piece of kit if you have insensitive headphones or want a little extra tonal flexibility from your portable set up. It’s available at prices that make it an easy decision for most people. FiiO also offer higher priced devices which, on the basis of the E5 probably also do a reasonable job although I’ve not heard them. If, on the other hand you’re looking for something to amplify a main – non-portable - source into your headphones it may be worth looking at one of the oriental valve headphone amps that are also available pretty cheaply on the big auction site.